Can I be honest with you? I wasn’t done with the Bar None shop in Dinktytown in Minnesota. I don’t think my cat Quincy was finished either. He’s still on a diet and probably would have kept discovering clues and, regrettably, bodies. But I’m thrilled to tell you that I’ve met someone new that I think you’ll like. Her name is Tally Holt and she lives in Fredericksburg, Texas. Rumor is that she’s almost as good as solving mysteries as I am, and that her vintage sweet shop could give my dessert bar shop a run for the money. What’s that, Quincy? Oh yes, he reminded me to tell you that Tally also has a cat. Not right at first, but pretty soon into the story. Even though I won’t be with you in any more books, I do intend to follow Tally’s adventures and have her books on my nightstand at bedtime. I’d like to ask Tally a question, since she’s right here. This is Janet speaking. My books won’t continue beyond the three already about: FAT CAT AT LARGE, FAT CAT SREADS OUT, and FAT CAT TAKES THE CAKE. I’d like to give away a signed copy of one of these—your choice. Please leave a comment telling me which book(s) you want, and I’ll pick a winner at the end of Wednesday, the 7th. I I’ll peek in here around midnight EDT. THANKS FOR ALL THE SUPPORT MY READERS HAVE GIVEN THIS SERIES! IT’S BEEN A FUN, FUN TRIP. I love these. I need Fat Cat at Large. thanks for the chance. I am missing Fat Cat at Large! Great to hear about Tally and a book set in Texas! Will miss Quincy! Thanks! Love the books cover. Would love to read Fat Cat Takes the Cake. Fat Cat Takes the Cake. but I'll follow to the new series. This series takes place in my backyard (I'm about 2 miles from MOA) and I haven't read it yet! I'd love any of the books. Congratulations on the new series! I am looking foward to reading it! I am sorry that there won't be anymore Fat Cat books. Please don't enter me. 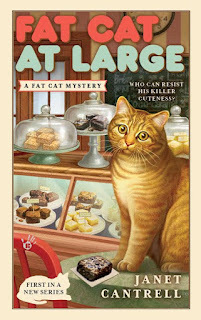 I'd love to win Fat Cat at Large--I love cozies and my very own fat kitty recommends this one. Oh no! I've been wanting to start this series for awhile. How sad it won't be continued. I'd love to receive a copy of the first one. Thank you so much for the chance!! Fat Cat At Large please! I really enjoyed getting to know this series and am going to miss it. Fat cat at large. New to the series but seems like a great read. Sorry to see the Fat Cat series end. Looking forward to the new series with Tally Holt. If I am drawn I would like to read "Fat Cat At Large". Since I already have all your books I will excuse myself from the contest, but wanted to say congratulations on your new series! So looking forward to reading it! Forgot to mention, these are new to me so any of the books would be fine. Thank you! Fat Cat Spreads Out - so sorry this series is done! I will look for your new series! This looks like a great series. Sorry it won't continue. I haven't read any of the series yet so book one would be perfect. I can't wait to read your new series. Thank you for the opportunity to receive your book. I assume this is yet another instance of publisher stupidity. There is entirely too much of that going around! I'd be happy with any of the books and look forward to your new endeavor. Fat cat spreads out. Sorry to see this series ending so soon. Looking forward to a future series from you. Fat Cat Spreads Out, please! Fat Cat Takes The Cake. Sorry to hear that the series will not continue, but I am looking forward to the new series. Fat Cat Spreads Out would be my selection. Thanks for the opportunity. I'd choose the first in the series. Thanks for the chance. Congrats on your new series, but I'm sorry that this series isn't continuing. I would love to have a copy of "Fat Cake Takes the Cake". Looking forward to your new series. Big fan. Love your books. 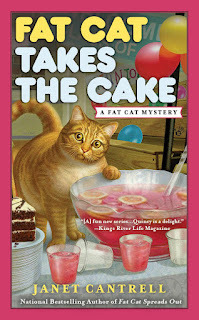 Would love to get Fat Cat Takes the Cake. Looking forward to your new series. Would love to win Fat Cat Takes the Cake. Your book covers make me smile! On my To Be Read List. So much fun. FAT CAT AT LARGE for me thank you. I'm bummed there won't be anymore. I would love Fat Cat Spreads Out or Fat Cat Takes the Cake. Thank you for the giveaway. I can't believe the Fat Cat series isn't continuing. I would like to win The Fat Cat Takes the Cake. Good luck with the new series. I will read it. Fat Cat at Large please. Love the cover. I used to babysit for a little girl who called herself fat cat pooh bear. Haven't thought of that name in years. Really need to win and read this book!! Fat Cat Spread Out. They are cute. Can't wait to start reading them. Thank you for the chance. Would love Fat Cat Takes The Cake - thanks for the giveaway. I love your covers and I hate to hear that the series isn't continuing. I would love Fat Cat takes the Cake please...and thank you for the chance. I enjoy the cats in the cozies. So if I win, FAT Cat at Large would be my choice. Thanks for this opportunity. Fat Cat Takes the Cake please if I win. I hate to hear this series is ending but excited about your new series. Best of Luck!! So sorry it won't be continuing. I've been wanting to start this series for awhile. How sad it won't be continued. I'd love to receive a copy of the second one. Thank you so much for the chance!! I'm sorry your series is ending. Perhaps we'll see Quincy again someday, somehow. I look forward to your new series though. SHould I be lucky enough to win I'd love a copy of FAT CAT TAKES THE CAKE. hmmm cake... perhaps I'm channeling Quincy. So sad the series is ending. I've read them all, but I only have Fat Cat Spreads out on my Kindle. I'd love to have a real copy of it. Looking forward to the new series. kchinetti at gmail dot com. I don't have any of your books, but would love to read them. I live in Minnesota and like to read books set in Minnesota. I don't have Fat Cat Spreads Out. Love this series. I'm clocking in a bit late today, but have to tell you that Sharon Forrest has won a Fat Cat book! I'll email you, Sharon, for your address. THANK YOU, EVERYONE WHO ENTERED!